As a medical professional, it is important to recognize what you want out of your career. Once you know what you want from your career, it is important to find the right people to get you on the right track. Instead of struggling to find the best jobs to fit your goals, open your mind to help that is available through a recruiter. For most people, it is a struggle to find a work-life balance. The demands on healthcare professionals are intense. On top of those demands, there is continuing education, and in some instances, a family or personal commitments that need you. The balancing act is tough, but a recruiter gets it. Their goal is to place each candidate in the right position that allows balance. Recruiters do this because they take the time to listen to you and your needs. With all the different positions available, it can be overwhelming. Every position has specific criteria from that client. By working with a recruiter, everything you have filed with your application and resume can easily be used in connecting you with the right job. The recruiter does the searching for you. A recruiter will work for you. They review your experience and needs, and match them with open positions. Recruiters get you noticed. When you work with a recruiter, a recruiter learns what your goals are and works with you. Recruiters are essential in helping you advance your career. As you gain more experience or education, a recruiter will work to place you in more challenging positions. If the fit is not right, the recruiter will let you know that it does not match you. Your success is the recruiter’s success. 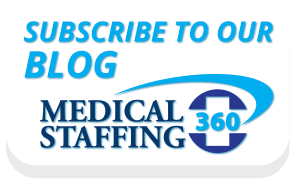 Medical Staffing 360 wants you to have a prosperous career. Our recruiters are steadfast in their approach to find the right position for each person. Contact Us today to get more information.